Considered as the Pride of India, the NDA entrance examination is conducted by the Union Public Service Commission (UPSC) and like the other administrative examinations it conducts, the NDA is no piece of cake either. To qualify this examination, candidates should thereby start their preparation deploying expert planning and strategies as the NDA looks for very specific qualities and aptitudes in the candidates it accepts for admission and training that will place them in the various ranks within the armed forces. In the NDA examination, the merit ranks obtained by the candidates will be the sole basis of their future career. Eligible candidates can now make use of our series of extremely well-tested mock tests of the NDA exam to prepare for their upcoming exam. The all-new mock test series of the NDA examination is here! 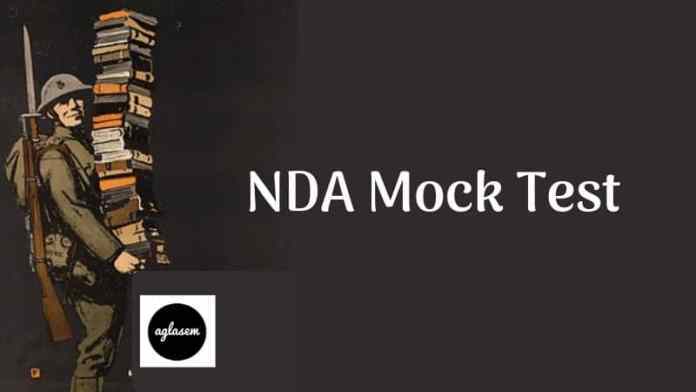 The free mock test of the NDA will help the candidates who will be appearing in the NDA examination 2019 or planning to appear in the near future, to analyze their preparations and sharpen their skills and also brush up their concepts. Hence, come make use of these mock tests that we have prepared for you and excel in the final test! English: Vocabulary, Grammar and Usage, Comprehension and Cohesion in extended text to test the candidate’s proficiency in English. It tests the candidate’s understanding of English and the use of words. General Knowledge: This section contains topics from the physics, chemistry, general science, geography, current events, history, freedom movement etc. This question paper will judge the candidates’ varied knowledge on all topics. The candidates are expected to be able to answer these questions without any kind of specialized study. General Principles in the working of the following: Simple pendulum, Simple Pulleys, Siphon, Levers, Balloons, Pumps, Hydrometer, pressure cooker, Thermos flask, Gramophone, Telegraph, Telephone, Periscope, Telescope, Microscope, Mariner’s Compass, Lightning conductors, Safety Fuses, etc. The Solar System – Meteors and Comets, Eclipses. For History, Freedom Movement etc. Prominent personalities—both Indian and International including those connected with cultural activities and sports. For any exam candidates should make a proper strategy to crack the exam. In the case of NDA, candidates may have many doubts about how to prepare it in such a short time. So here are a few tips to sharpen up your skills. At first, understand the exam pattern and then try to comprehend and summarize the vast syllabus into more concise bullet points, with the use of umbrella terms. Analyze the syllabus thoroughly. Now sieve out your skills from weaknesses. Sticking to the plan, if there is very less time, instead of wasting time trying to find a solution to your problem, try to be an expert on the topics you know about and are confident. There is a negative marking of 0.33 marks in the examination. hence it is not a good idea to randomly answer questions. Brush up your basics to calculate faster. The NDA entrance examination is the gateway through which admission into India’s most prestigious institution, The National Defence Academy, can be sought. The NDA exam qualifies candidates for the NDA to join either of the three wings of the Indian Army: the Army, the Navy and the Air Force. The Union Public Service Commission of India conducts the NDA examination twice every year. Through this exam, candidates will gain admission into the following institutes across the country: Indian Military Academy, Officers Training Academy, Indian Naval Academy and Indian Air Force Academy.